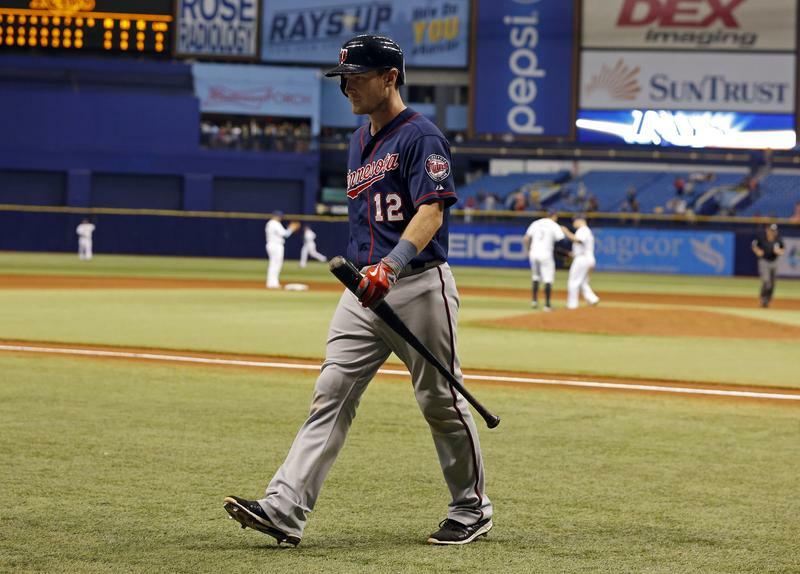 Who will the Twins purge from the 40-man roster this offseason? A.J. Achter: Called up as a late-season bullpen reinforcement in each of the past two seasons, Achter has allowed 17 runs in 24 innings for the Twins. His numbers at Triple-A are much better, including a 2.57 ERA and 21 saves in 99 appearances, but there's nothing impressive about his 136/51 K/BB ratio in 144 innings there and Achter's fastball tops out in the low-90s. He could find a niche as a middle reliever, but at age 27 he doesn't possess much upside beyond that. 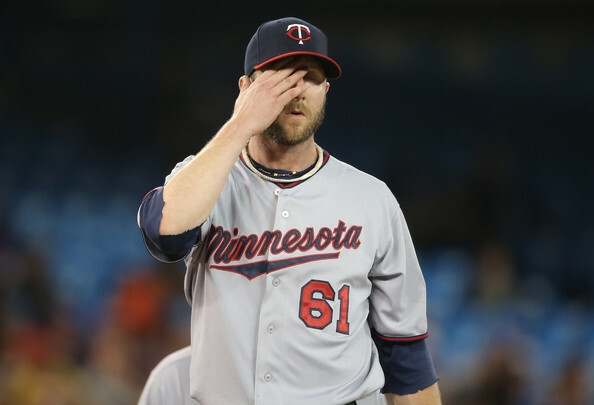 Logan Darnell: After making four starts and three relief appearances for the Twins last season Darnell didn't pitch in the majors this year, going on the disabled list with pneumonia following a September call-up. Darnell was used primarily as a reliever at Triple-A, posting a 66/25 K/BB ratio in 78 innings. He works in the high-80s with his fastball and combines mediocre strikeout rates with poor control, so it's tough to see the 26-year-old lefty as more than a middle reliever. Casey Fien: Arbitration eligible and due a raise to around $2.5 million, Fien could be expendable if the Twins get serious about upgrading the bullpen. He has a lifetime 3.82 ERA, including a 3.55 ERA and 41/8 K/BB ratio in 63 innings this season, but Fien is a low-strikeout 32-year-old and fits best in middle relief. They have bigger issues to address and a $2.5 million price tag isn't much, but the Twins could use more youth, velocity, and upside in Fien's role. Eric Fryer: Re-added to the 40-man roster on September 1 because the Twins wanted a third catcher around once rosters expanded, Fryer has passed through waivers unclaimed before and figures to do so again. At age 30 he's hit .243/.329/.336 in 65 games as a major leaguer and .237/.328/.328 in 271 games at Triple-A. Organizations need players like Fryer around because catching is difficult to acquire midseason, but there's no need to have him on the 40-man. Chris Herrmann: For long stretches in each of the past three seasons the Twins have gone with Herrmann as their backup catcher and he's hit .181/.249/.280 in 142 games. Among all players with at least 300 plate appearances for the Twins since 1985 his .529 OPS ranks second-worst, ahead of only his backup-catching predecessor Drew Butera at .494. And he hasn't been much better in the minors, hitting .261/.336/.391 in 152 games at Triple-A. Tommy Milone: In a season that included a month-long demotion to Triple-A and multiple arm injuries Milone still ranked among the Twins' better starters with a 3.92 ERA and 91/36 K/BB ratio in 129 innings. His track record as a solid back-of-the-rotation starter is well established by 619 innings of a 3.97 ERA, but the question is whether the Twins want to pay him around $5 million via arbitration for 2016 when they seemingly have too many mediocre veteran starters as is. Ricky Nolasco: He's owed $25 million for the next two seasons and the Twins can't escape that commitment, but there are two ways in which they could remove Nolasco from the 40-man roster to make use of his spot. One is to simply get rid of him via trade or release, both of which would require eating the remaining contract. The other is to let him pass through waivers unclaimed and outright him to Triple-A sans 40-man spot. Unlikely, but an option if space gets tight. Eduardo Nunez: After five seasons as a below-average hitter Nunez finally produced a little bit, hitting .282/.327/.431 in a bench role. In two years with the Twins he's started 45 and 48 games while getting 213 and 204 plate appearances. Keeping him around in a similar role makes sense, but with Nunez due for a raise to around $2 million via arbitration it's possible the Twins will want to fill that bench spot with either a more capable defensive shortstop or a more potent bat. Ryan O'Rourke: Added to the 40-man roster and called up in July to fill a left-handed specialist role, O'Rourke fared well initially before going through a rough patch and then mostly collected dust down the stretch. He held lefties to a .171 batting average for the Twins after dominating them to an incredible degree in the minors, so there's little doubt O'Rourke can fill the specialist role, but control problems and struggles versus righties really limit his potential usage. Josmil Pinto: Pinto once looked like a long-term building block as a catcher/designated hitter, but he struggled in 57 games for the Twins in 2014 and spent all of 2015 at Triple-A having his season wrecked by concussions. When healthy Pinto is a good right-handed hitter with power and plate discipline whose defensive chops behind the plate are iffy. He's still just 26 years old, but catching regularly may be out of the question and the Twins have no shortage of DH options. Ryan Pressly: Sidelined for the final three months of the year by a lat muscle injury, Pressly's place in the Twins' plans depends on his health and a belief that his 3.46 career ERA tells a more accurate story than his 85/47 K/BB ratio in 133 innings. He's a perfectly solid middle reliever and throws harder than most of the Twins' incumbent options for that role, but the 27-year-old former Rule 5 pick hasn't found a way to generate strikeouts and has iffy control. Shane Robinson: After nine years in the Cardinals organization Robinson signed with the Twins as a minor-league free agent, won a spot on the Opening Day roster, and received a career-high 48 starts and 198 plate appearances. He hit just .250/.299/.322, which is in line with his modest track record. Robinson is a good defender with plus speed, but he doesn't hit enough to be more than a fifth outfielder and "fifth outfielder" is no longer even a job on many teams. Aaron Thompson: For six weeks or so Thompson emerged as Paul Molitor's go-to lefty setup man and got the Twins through a bunch of key innings unscathed, but his deal with the devil ran out and he was demoted to Triple-A in July. He was nothing special there and did not receive a September call-up, finishing the season with a 5.01 ERA and 17/11 K/BB ratio in 32 innings. At age 28 there's nothing in his track to suggest Thompson is more than a replacement-level arm. This week's blog content is sponsored by Harry's Razors, where you can get discounted razors and shaving supplies delivered to your door by entering in the code "gleeman" at Harrys.com. Last season Phil Hughes logged a career-high 210 innings and posted the best strikeout-to-walk ratio in the history of baseball. This year the durability and excellent control remain, but Hughes' strikeout rate has plummeted and his home run rate has skyrocketed. On a per-plate appearance basis his strikeouts are down 36 percent and he's served up a league-high 22 homers in 18 starts after allowing a total of 16 homers in 32 starts last season. Hughes' fastball velocity is down 1.5 miles per hour and hitters have teed off on it, adjusting to his strike-throwing machine approach and/or simply taking advantage of a lesser version of the pitch. Whatever the case, he's gone from No. 1 starter to innings-eating mid-rotation starter, which was the fear when the Twins reacted to Hughes' career-year by handing him a three-year, $42 million extension with two seasons remaining on his original deal. Nothing has really changed within Kyle Gibson's secondary numbers compared to last year, but his ERA has improved from 4.47 to 2.85 and he's avoided the blowups that plagued him every few turns in the rotation. His strikeout rate (16 percent vs. 14 percent), walk rate (8 percent in both years), and ground-ball rate (54 percent in both years) are all remarkably similar to last season and he's already given up almost as many homers (11) in 18 starts as he did (12) in 32 starts. The big change is opponents hitting .165 with runners in scoring position compared to .277 last year, which explains avoiding big innings. At some point those numbers are going to normalize and when they do Gibson looks more like a 3.85 ERA starter than a 2.85 ERA starter, but nothing says his luck has to run out immediately and a 3.85 ERA starter is still plenty valuable. He's been the best starter on a team that handed out $170 million to three free agent starters since 2014. Unhappy about being moved to the bullpen during spring training, Mike Pelfrey got his wish and remained in the rotation following Ervin Santana's suspension. He fared absurdly well early on despite no changes to his poor strikeout and walk rates, constantly getting himself into jams and then wriggling out of trouble. Eventually that caught up to Pelfrey, who finished the first half by allowing 27 runs in his final 32 innings to take his ERA from 2.28 to 4.00 in six starts. There's been lots of talk about pitching coach Neil Allen convincing Pelfrey to rely on off-speed pitches more, but that storyline loses a little steam when you consider his 4.41 xFIP is no different than his 4.42 xFIP for the Mets from 2008-2012 and his 4.5 strikeouts per nine innings are worse than his 5.0 mark during that span. Pelfrey has taken a somewhat different approach to pitching, but the results ended up in the same mediocre place once the early good fortunate vanished. Called up one week into the season to replace the injured Ricky Nolasco in the rotation, Trevor May led Twins starters in fastball velocity, strikeout rate, and xFIP. So naturally he was the starter moved to the bullpen when Santana returned from suspension. May took the demotion in stride, finishing the first half with four scoreless relief innings, but given his performance, raw stuff, and long-term upside the 25-year-old right-hander deserves to be in the rotation. May was a mess in his first few starts as a rookie, but in his last 25 games dating back to August he's thrown 121 innings with 113 strikeouts and 27 walks. He still has plenty to work on, but May has seemingly solved his control problems in the minors without sacrificing velocity or strikeouts and only needs more patience from the Twins to establish himself as a solid mid-rotation starter three years after they acquired him from the Phillies for Ben Revere. When the Twins acquired Tommy Milone from the A's in exchange for Sam Fuld last July he was an established mid-rotation starter with a 3.83 ERA in nearly 500 career innings. They never saw that pitcher, as Milone allowed 21 runs in 22 innings before being shut down with a benign tumor in his neck that required surgery. He came into this season with a clean bill of health and secured a spot in the rotation, but was demoted to Triple-A in late April. Milone toyed with Triple-A hitters, going 4-0 with a 0.70 ERA and 47/3 K/BB ratio in five starts before the Twins brought him back to replace the injured Nolasco. He predictably hasn't been able to continue racking up strikeouts since returning, but Milone posted a 1.84 ERA and 33/12 K/BB ratio in 44 innings during his final seven starts. He'll come back down to earth at some point, but Milone has been out-performing his modest raw stuff for five seasons now. He's a solid pitcher. J.R. Graham has been an ideal Rule 5 pick, showing long-term upside with a mid-90s fastball and proving useful in the short term when spotted in low-leverage situations. Sixteen pitchers have 10 or more innings for the Twins this year and Graham is the only one with an average fastball above 95 mph. Home runs have been an issue and Graham's command comes and goes, but remove one disastrous May 14 outing from his season totals and he has a 1.85 ERA in 39 innings. Who leads the AL in relief appearances? Blaine Boyer, obviously. He came into this season as a 33-year-old journeyman with a 4.63 career ERA and his current secondary numbers are actually worse than his career marks, including just 18 strikeouts in 39 innings. And yet Boyer has a 2.75 ERA while spending much of the season as the Twins' primary setup man, refusing to implode. It hasn't been all smoke and mirrors, but it's been a lot of smoke and mirrors. For the second straight season Ricky Nolasco has been injured and ineffective. This time he made just seven starts, going on the disabled list with an elbow injury in April and an ankle injury in June. After a month of unsuccessful rehab Nolasco underwent ankle surgery that seems likely to end his season, so he'll have a 5.40 ERA in 192 innings halfway through a four-year, $49 million contract. What a disaster. Already one of the three best closers in Twins history, Glen Perkins set a new team record by converting 28-of-28 save chances in the first half. He also had a 1.21 ERA and 36/5 K/BB ratio in 37 innings while holding opponents to a .188 batting average. Perkins has merged plus raw stuff, impeccable command, and an analytical approach to get extraordinary results in the ninth inning at a time when the rest of the bullpen has often been shaky. Aaron Thompson's deal with the devil lasted about six weeks, during which time the 28-year-old journeyman moved up the bullpen hierarchy to earn manager Paul Molitor's trust in a setup role. And then he turned back into a pumpkin, initially being relegated to left-handed specialist duties and then being demoted to Triple-A. Ryan O'Rourke replaced him in the bullpen, but Thompson remains on the 40-man roster and could return in a middle relief role. Ryan Pressly was a Rule 5 pick in 2013 and, much like Graham currently, was useful in the short term while showing some long-term upside with a mid-90s fastball. Two years later he has a 3.46 ERA in 133 total innings for the Twins, making up for poor strikeout and walk rates by allowing just eight homers in 556 plate appearances. Unfortunately now Pressly is sidelined by a strained lat muscle. After a three-season run as a quality setup man Casey Fien just hasn't been the same this year while struggling with some arm problems. He put together a couple of good stretches, but even during that success there were obvious red flags. Fien's velocity has been normal for the most part, but compared to 2012-2014 he's lost nearly half of his strikeouts and generated one-third fewer swinging strikes. That's a particularly bad combination for a fly-ball pitcher. For a lot more talk about the Twins' first half, check out this week's "Gleeman and The Geek" episode featuring our MVP ballots and player-by-player breakdowns. As part of the frustrating decision-making process that led to choosing the older, lower-upside option to fill nearly every up-for-grabs roster spot coming out of spring training the Twins now have a bullpen stocked with marginal big leaguers. To make matters worse their best setup man, Casey Fien, has been hurt and their lone standout reliever, Glen Perkins, continues to be in a role reserved for "save" situations that severely limit his overall usage. All of which has added up to new manager Paul Molitor turning to an assortment of replacement level-caliber arms and repeatedly watching them fail, often in high-leverage spots. Twins relievers have combined to throw 21 innings with a 5.91 ERA and nearly as many walks (8) as strikeouts (10). Among all MLB teams the Twins' bullpen ranks either worst or second-worst in ERA, xFIP, strikeout rate, strikeout-to-walk ratio, and opponents' batting average. Assuming that Fien's shoulder issues prove minor he'll soon be taking on a lot of the late-inning setup work that's been going to lesser options and in general the Twins' bullpen isn't as bad as it's looked so far because basically no bullpen is that bad. However, when you bypass better, younger, higher-upside options to give jobs to mediocre, low-upside veterans a bad bullpen is exactly what you get. No one, least of all the Twins, should be surprised by the early results. This offseason 32-year-old left-hander Brian Duensing was a non-tender candidate because his inability to neutralize right-handers made him ill-suited for a setup role, but the Twins retained him for $2.7 million and kept him in a key role. They also spent $2.2 million on 33-year-old free agent right-hander Tim Stauffer, whose nice-looking raw numbers for the Padres came attached to a 90-mph fastball and included a 4.28 ERA away from MLB's most pitcher-friendly ballpark. When the Twins signed Blaine Boyer to a minor-league deal in January it seemed like a move made mostly for organizational depth, because he's a 33-year-old journeyman with a 4.63 ERA in the majors and a 5.31 ERA at Triple-A, but he ended up making the team largely on the basis of a half-dozen spring training innings. Another former minor-league signing, 28-year-old journeyman Aaron Thompson, was chosen as the third lefty despite an underwhelming track record. If healthy Perkins is a good closer and Fien is a decent setup man, but the Twins chose to fill the other five bullpen spots with Duensing, Stauffer, Boyer, Thompson, and Rule 5 pick J.R. Graham. And in creating that seven-man bullpen in which the only pitcher under 30 years old is there via the Rule 5 draft Molitor and the front office passed over several younger, cheaper, higher-upside relievers already in the organization. 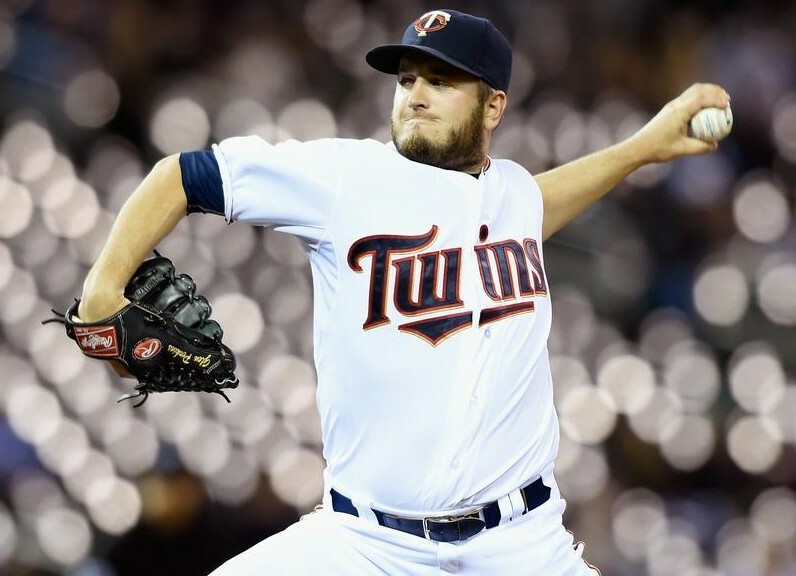 Michael Tonkin is 25 years old and has pitched well in a few brief stints with the Twins, posting a 3.26 ERA and 26/9 K/BB ratio in 30 innings while averaging 94 miles per hour with his fastball. He was sent back to Rochester for his third straight season at Triple-A, where Tonkin has a 3.39 ERA and 85/21 K/BB ratio in 80 innings. He's young and cheap, he throws hard and misses bats, and he's fared well at Triple-A and in Minnesota. 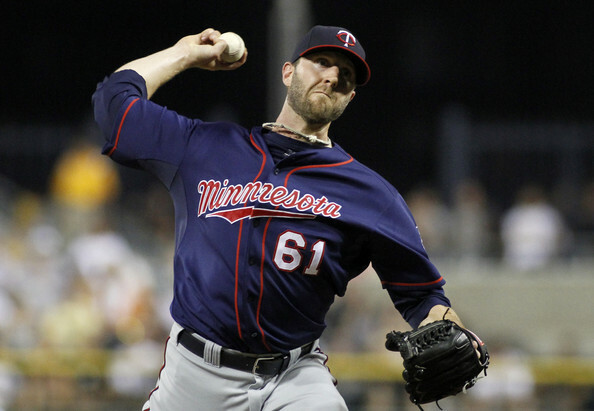 Caleb Thielbar spent most of the past two seasons in the Twins' bullpen and pitched well as the third lefty, throwing 94 innings with a 2.59 ERA and 74/30 K/BB ratio. Ryan Pressly also spent much of the past two seasons in the Twins' bullpen, posting a 3.60 ERA in 105 innings. Pressly's secondary numbers were much less impressive, but he averaged 93 miles per hour with his fastball in the majors and has pitched well at Triple-A. They were both demoted to Rochester. Lester Oliveros was acquired from the Tigers in the Delmon Young trade and missed most of 2013 recovering from elbow surgery. He returned last season to split the year between Double-A and Triple-A, posting a 1.64 ERA with 88 strikeouts and zero homers allowed in 66 innings. At age 27 his upside is limited and Oliveros' control can be iffy, but he throws in the mid-90s and has averaged 11.2 strikeouts per nine innings for his minor-league career. Using the $5 million they spent on Duensing and Stauffer to acquire better relievers is something the Twins could have done this offseason, but even ignoring that possibility they had no shortage of intriguing, cheap, in-house bullpen options deserving of an opportunity and/or extended stay in the majors. They chose to give roster spots to none of them and the early results are what that flawed decision-making process deserves. For a sadness- and anger-filled discussion of the Twins' rough opening week, check out the latest "Gleeman and The Geek" episode. Twins decline $3.6 million option on Jared Burton; bullpen overhaul next? Rather than keep right-hander Jared Burton around for next season at a cost of $3.6 million the Twins declined his 2015 option and paid him a $200,000 buyout, making the 33-year-old reliever a free agent. Burton was a great scrap-heap pickup for the Twins after his career was derailed by injuries with the Reds and not so long ago his 2015 option looked like it might be a bargain, but his performance and raw stuff both slipped this season. Burton debuted for the Reds in 2007 as a 26-year-old and posted a 3.47 ERA in 161 innings from 2007-2009, but then arm problems caused him to miss most of 2010 and 2011. Cut loose by the Reds in November of 2011, he signed a minor-league contract with the Twins two weeks later and made the Opening Day roster out of spring training. He was an elite setup man in 2012 and much of 2013 before fading down the stretch, and those struggles continued this season. If the Twins felt Burton was a decent bet to bounce back next season $3.6 million certainly isn't a crazy price tag for a late-inning reliever, but he has a 5.12 ERA and 50/28 K/BB ratio in 72 innings since August of 2013 and averaged just 91 miles per hour on his fastball while being overtaken as Glen Perkins' primary setup man by Casey Fien. Plus, if the Twins are planning to have a payroll below $90 million again there's hardly any room under their self-imposed spending limit. 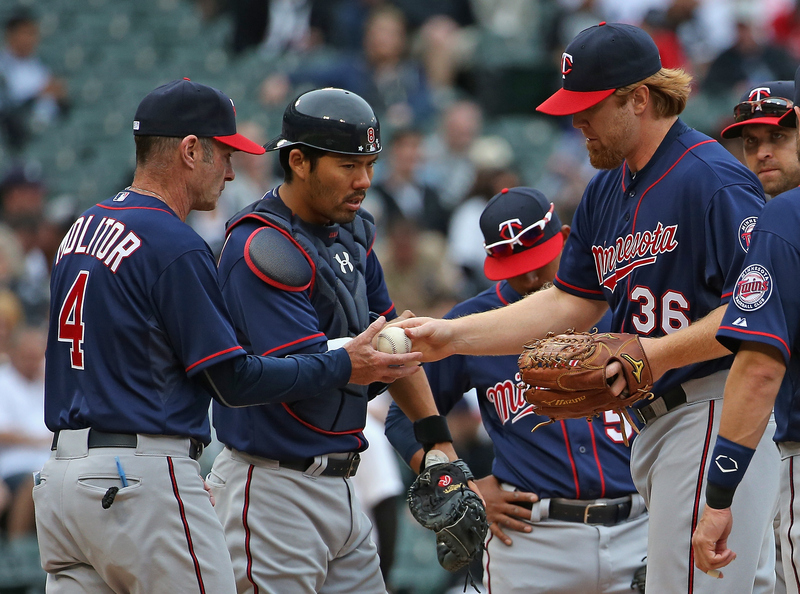 Six relievers appeared in 30 or more games for the Twins this season and their bullpen could look much different in 2015. Perkins is signed through at least 2017 and Fien is a lock to be retained via arbitration, but rising salaries and underwhelming performances make the arbitration-eligible duo of Brian Duensing and Anthony Swarzak non-tender candidates. That would leave Perkins, Fien, and low-leverage lefty Caleb Thielbar as the bullpen holdovers. It would also clear the path for less experienced relievers like Michael Tonkin, Ryan Pressly, and Lester Oliveros to take bigger roles and the Twins still have Mike Pelfrey and his one-pitch repertoire under contract for $5.5 million. Factor in starter prospects who could benefit from being worked into the mix as relievers, plus various intriguing bullpen arms in the minors, and the Twins may be able to get both cheaper and better by overhauling the bullpen around Perkins and Fien. For a lot more about the Twins' payroll plans and Terry Ryan's comments about the team's lack of spending, check out this week's "Gleeman and The Geek" episode. A.J. Achter: Added to the 40-man roster in September after a nice season between Double-A and Triple-A, the former 46th-round pick debuted at age 26. His success this season was driven largely by an unsustainably great batting average on balls in play and Achter's control has never been particularly good, which along with a high-80s fastball and unspectacular strikeout rates makes him unlikely to project as more than a middle reliever. Doug Bernier: Last year the Twins called up Bernier to fill a little-used bench role and dropped him from the 40-man roster after the season, which is presumably the plan again this time. He had a solid season at Triple-A, hitting .280/.348/.396 in 124 games, but Bernier is 34 years old and the epitome of a replacement-level player. Great to have stashed at Triple-A, not great to have in the majors or even taking up a spot on the 40-man roster. Jared Burton: One of the Twins' better scrap-heap pickups, Burton was a high-end setup man for a year-and-a-half before struggling down the stretch last year and showing major signs of decline this season. Dating back to August of last season Burton has a 5.12 ERA and 50/28 K/BB ratio in 72 innings. His velocity is down, he's ceased missing bats, and at age 33 it's hard to see him being trusted enough in a high-leverage role to justify picking up his $3.6 million option for 2015. Chris Colabello: He was a good story and absolutely deserved a shot in the majors after crushing Triple-A pitching, but Colabello hit .214/.284/.364 with a ghastly 124/34 K/BB ratio in 114 games. He has no defensive value and, unlike most right-handed hitters, his approach at the plate doesn't lend itself to crushing left-handers. At age 31 it's tough to imagine giving him another extended opportunity, especially considering the Twins' depth at first base and designated hitter. Logan Darnell: It's tough to see Darnell sticking in the big leagues as a starter. He has a 3.82 ERA with a poor strikeout rate and mediocre control in 172 innings at Triple-A, his average fastball so far in the majors is 89 miles per hour, and he struggles against right-handed hitters. At age 25 he may still have a future in the bullpen, but the same could be said of nearly every left-handed starter and there isn't much in his track record to suggest his upside there is notable. Brian Duensing: It's masked by a strong ERA, but Duensing's secondary numbers collapsed with a 32/20 K/BB ratio in 53 innings. His inability to handle righties means he can't be trusted in the late innings and he's not dominant enough against lefties to be a southpaw specialist. Duensing is a perfectly decent middle reliever, but at age 31 and with an arbitration-fueled raise to at least $3 million coming for his final pre-free agency season he's a non-tender candidate. Eric Fryer: Tabbed to fill the Drew Butera role as a catcher who can't hit enough to warrant a roster spot, Fryer took over as Kurt Suzuki's backup when the Twins demoted Josmil Pinto to the minors. He's hit .248/.325/.345 in limited MLB action, which is actually much better than his .217/.314/.316 line in 204 games at Triple-A. Even if the Twins are convinced Pinto has no future behind the plate they can do better than Fryer as a second (or third) catcher. Chris Herrmann: In theory Herrmann brings versatility to the table as a catcher/outfielder, but the Twins want nothing to do with him behind the plate defensively and he doesn't hit enough to have any business in the outfield. He's hit .184/.256/.268 in 91 games for the third-worst OPS in the Ron Gardenhire era of 2002-2014, ahead of only Butera and Tsuyoshi Nishioka. And at age 27 his .262/.331/.399 line in 129 games at Triple-A is barely any better. Kris Johnson: Acquired from the Pirates as part of the Justin Morneau trade, it was never clear why the Twins wanted Johnson unless they focused on his misleadingly good 2.39 ERA at Triple-A last season. He posted another decent-looking 3.48 ERA at Triple-A this year, but managed just 102 strikeouts in 132 innings while walking 3.8 per nine frames. Johnson is 30 years old with 6.2 strikeouts and 3.5 walks per nine innings for his career at Triple-A. Eduardo Nunez: When the Twins acquired Nunez they talked up his offensive potential as if he hadn't hit .267/.313/.379 for the Yankees or had similar numbers in the minors. He's been even worse for the Twins, hitting .251/.274/.385 in 67 games. Ultimate Zone Rating pegs him as one of the worst shortstops in baseball at 30 runs below average per 150 games and he's looked shaky at third base as well. It's unclear where exactly the upside is with the 27-year-old Nunez. Lester Oliveros: He hasn't looked good in the majors yet, but Oliveros put together an excellent season between Double-A and Triple-A in his first full year back from Tommy John elbow surgery. He struck out 88 batters in 66 total innings, posting a 1.64 ERA while allowing zero home runs. His control remains spotty, but with a mid-90s fastball and outstanding strikeout rates Oliveros seems deserving of an extended chance. It's just unclear if he'll get that in Minnesota. Chris Parmelee: Since his big September debut Parmelee has hit .237/.303/.372 in 248 games for the Twins, showing mediocre power while failing to control the strike zone. Good numbers at Triple-A suggested the former first-round pick may have finally figured things out, but he's failed to do anything with semi-regular playing time in three straight seasons and will soon be 27 years old. Why keep waiting for what might be, at best, an average first baseman/corner outfielder? Mike Pelfrey: Re-signing Pelfrey to a two-year, $12 million deal never made any sense and he allowed 23 runs in 24 innings before being shut down with an elbow injury. He's owed $5.5 million next season, so Pelfrey being cut loose would be a surprise, but he's 12-29 with a 5.00 ERA in 390 innings since 2011, throws one mediocre pitch, and injuries have wiped out two of his last three seasons. He's a sunk cost, but perhaps they can salvage some value out of Pelfrey in the bullpen. Yohan Pino: When he was a prospect posting great numbers in the minors from 2005-2009 the Twins never called up Pino, but they finally gave him a chance as a 30-year-old journeyman in his second stint with the organization. Pino had an ugly 5.07 ERA in 11 starts and struggles to limit home runs, but his 50/14 K/BB ratio in 60 innings was solid. As the past four seasons have shown there's always plenty of need for rotation depth, but elbow problems cloud his status for 2015. Ryan Pressly: After spending all of last year in the majors as a Rule 5 pick Pressly spent most of this year at Triple-A, throwing 60 innings with a 2.98 ERA and 63/21 K/BB ratio. He throws hard, but it has never led to big strikeout rates and Pressly has just 63 strikeouts 102 innings for the Twins. He has a nice-looking 3.54 ERA and the Twins have been to known to let that sway their opinion more than it should, but at age 26 it's tough to see significant upside. Stephen Pryor: Acquired from the Mariners in the Kendrys Morales swap/salary dump, Pryor is one of the few players on the 40-man roster not to receive a September call-up. He was once a top reliever prospect with a high-90s fastball, but he's struggled to regain velocity after shoulder surgery. He posted a 3.93 ERA at Triple-A with awful control and just 52 strikeouts in 55 innings. Still just 25 years old, presumably the Twins liked Pryor enough to see what he looks like in 2015. Jordan Schafer: It seems unlikely that the Twins would get rid of Schafer after how well he's played in 40 games since they claimed him off waivers in early August, but he's the type of player who regularly gets dropped from 40-man rosters. Schafer is a 27-year-old career .230/.312/.311 hitter who also batted just .225/.278/.294 at Triple-A and despite great speed he's a mediocre defensive center fielder. He's a decent fit as a backup outfielder, but that skill set is plentiful. Anthony Swarzak: After flopping as a starter Swarzak found a fit as a long reliever able to soak up low-leverage innings, but his effectiveness slipped this year and he's due for a raise to around $2 million via arbitration. Swarzak's strikeout rate of 5.2 per nine innings ranks 125th out of the 131 pitchers with at least 50 innings as relievers and his career rate as a reliever is 5.8 per nine innings. His role could be better utilized to break in a young starter. Aaron Thompson: His flukishly good numbers versus lefties this season caught the Twins' eye and earned him a call-up, but Thompson is a 27-year-old journeyman with a high-80s fastball and a 4.33 ERA in a decade as a minor leaguer. That includes a 3.52 ERA and 107/51 K/BB ratio in 120 innings at Triple-A. Like most reasonably effective lefties he could probably hold his own in a southpaw specialist role, but the Twins should be aiming higher for a Duensing replacement.